Friday giveaway time. Today it is 14 vintage juvenile titles, Hans Brinker to The Hardy Boys. Leave a comment here to enter, or enter on Facebook or Twitter. I'll sort through all the entries and pick a winner at random tomorrow morning at 10:00 AM EST. Contest is closed, will update with a winner in a moment. Hey, I'll take an entry. Thanks! Count me in! Those look awesome! I'd love to win these! Thanks for the opportunity! What an amazing selection of children's books! The spines are so neat looking, I bet the insides are just as wonderful. I would love to get those books for the little readers in my house. Thank you! These are lovely! They'd look awfully nice on a shelf next to my antique magic lantern projector. These look lovely! And they'd be great on a shelf next to my antique magic lantern projector! Nice collection. I'd like it even better if it were mine... lol! Nice collection! I'd love it even more in my library... lol! Awesome collection! I would love to win this for my 12 year old son who collects vintage kids books! Great selection of books! I'd love to have them! 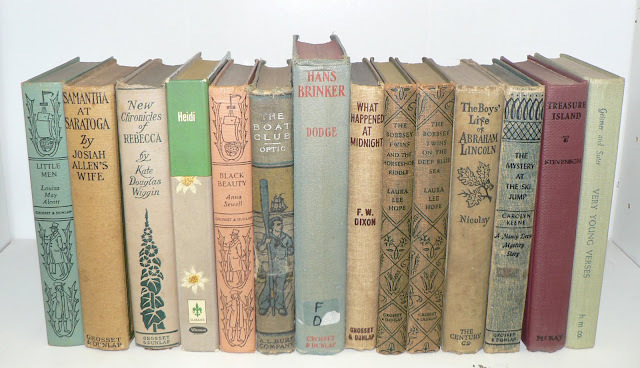 What lovely books--they remind me of my grandma's old bookshelf . . . great memories! A great giveaway! Thanks for the opportunity! I just love children's lit. Please include me in the giveaway. Thank you! Oh, me me me me me! That is, I grew up as a huge Laura Lee Hope fan, but I only ever was able to find the first three books in the Bobbsey Twin series.... But I'm sure anybody will enjoy these-- they look lovely! I want to be a random winner. Would love to win these books to enjoy with my Grandchildren. I love vintage children's books! Count me in! Looks like a wonderful collection for my grandkids that love to read! What a wonderful collection of children's books! I'd love to enter. Thanks so much! OOOH, several of those look very familiar-- can even remember exactly how they smelled. Many happy hours frittered away reading Nancy Drew especially! Would appreciate an entry for this batch of nifty books, thank you! Amazing giveaway ! !I would be happy with one of these lovely books !Love the Heidi ! Thanks for the chance ! I so want to win! Classic Nancy Drew ftw! Would love to win this batch of books! Thanks for all the great giveaways! All the better because I read half of these when I was little! Yes please! I want to know what happened at midnight. I would love to have these for the kids' bookcase! Top shelf though, so they don't get handled too much. These are great! vintage books for a first year elementary teacher? yes please! What a lovely set. Can never go wrong with the classics! Thanks for a chance.